Color(s): Any shade of gray, although wolf gray is the most common. Originating in Portugal, the Cao de Castro Laboreiro is also referred to as the Portuguese Cattle Dog. They were developed as a guardian of livestock, family, and property. This ancient breed is not well known and is considered to be rare and difficult to obtain. The Cao de Castro Laboreiro possesses a fearsome and penetrating expression. This breed is muscular, well-built, robust, and medium to large in size. They exhibit an imposing and haughty presence. 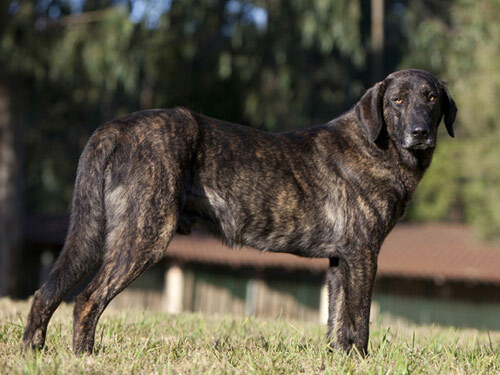 The Cao de Castro Laboreiro breed is dynamic, dominant, and not recommended for inexperienced dog owners. They are suspicious and wary of strangers. The Cao de Castro Laboreiro is extremely protective of their family, property, and territory and are formidable opponents if threatened. They are not recommended for homes with dogs or other household pets. They are playful and patient with children they have been raised with. They make loyal, trustworthy, and devoted companions and guardians. Regular brushing to remove loose and dead hair is recommended for the Cao de Castro Laboreiro. Bathing should only be done when absolutely necessary. Due to the rarity of this breed there are no known health issues. The coat of the Cao de Castro Laboreiro is weather-resistant, thick, smooth, rough, and dense. This is a single coat breed. The Cao de Castro Laboreiro is highly intelligent and will only tolerate orders from their owners. They require a master with experience and a respect for this breed. Early socialization and obedience is a must. Cao de Castro Laboreiro's will not respond to harsh or heavy-handed methods. Training must be done with firmness, fairness, and consistency. The Cao de Castro Laboreiro breed is not recommended for city or apartment living. The Cao de Castro Laboreiro must be in a rural setting with a job to do and ample space to safely roam.